But aluminum-free deodorant — one that actually works — can be difficult to replace. Especially for the men in our lives! …I set out to meet the more specific needs of a man. After trialing a few different recipe combinations, this one’s a winner! And it certainly stood the test with by far the best odor and wetness control. 1. In a double boiler, or small pot, melt cocoa butter, coconut oil, shea butter, and beeswax over low heat. 2. Remove pot from heat — allow mixture to cool slightly — then add arrowroot powder, baking soda, and bentonite clay. 3. Mix with wire whisk or chopsticks until all powders are dissolved and well combined. 4. Add vitamin E oil and essential oils. 5. Allow mixture to cool in pan. Once it is cooled and the consistency of pudding, open the capsule of probiotics and add powder to mixture. Stir quickly to combine. 6. Add mixture to clean, used deodorant container. Place in refrigerator to cool and harden. After this, product may be stored on counter. This recipe will fill container and last for 3-4 months. Remember…a little goes a long way! –Mountain Rose Herbs…they have everything you’ll need for this project! It’s your one-stop-shop! -Find beeswax locally through this link. 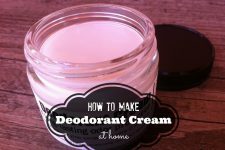 Homemade Probiotic Deodorant - That Really Works! Thanks for the recipe! As a vegan, I do not use beeswax. 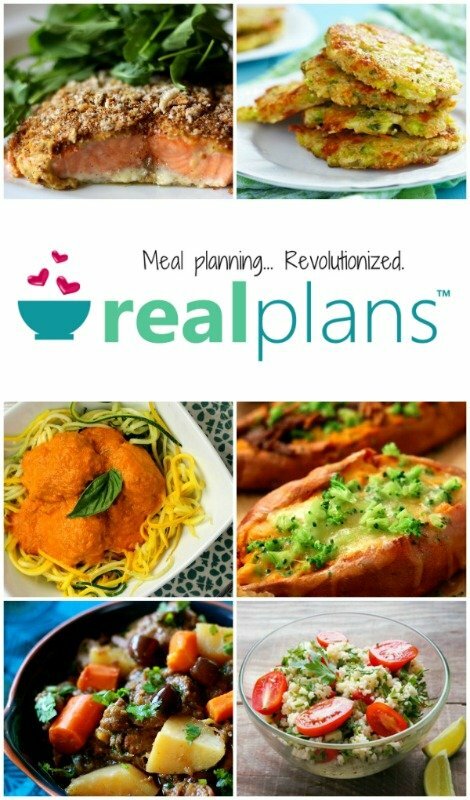 Do you have any suggestions for substitutes or changing the ratio of the other ingredients to compensate for not using it? I’d love to be able to try this! Thanks! Great question Aimee! For vegans I recommend Carnauba Wax (can be purchased through Mountain Rose Herbs) or GMO-free Soy Wax. I’m not confident enough to speak truthfully regarding the ratios. I do believe that Carnauba Wax is a bit harder…requiring less in the recipe…but I haven’t worked with it much. I’d really like to though:) I wonder if anyone else can help educate us!?! This is wonderful I have two questions however. 1. Is there a substitute for coconut oil since we are allergic in this house. 2. Do you make deodorants without coconut oil? there is a recipe on my pinteresting facebook page made without coconut oil… how are you with cocoa butter? My problem with natural deodorants is wetness. What do you do about wetness? Awesome! Thanks so much for sharing this recipe. Great recipe! I love homemade deodorants that include clay. They absorb really well. At least for this sweaty girl 🙂 The manly scents are my favorite. If you can’t be in the forest, at least smell like one! I have everything but the vit. E oil! Can this be made without?! I would love to make my husband deodorant but when I made the probiotic deodorant version for myself, it didn’t harden that well. It’s somewhat firm but when I start to use it really smears. Also the Shea butter I bought is very yellow and make every recipe I use it in smell strongly of Shea butter and yellow. So my three questions are 1. Is the man deodorant recipe firm? 2. Do you know what went wrong with my deodorant? 3. Why does my Shea butter look the way it does? Thanks so much for your help Andrea!! Rather than shea butter you may want to try cocoa butter. It’s quite a bit harder. This looks like it would be a really effective product for me and my family. Being lazy, I might order it from you on Etsy.com before making the effort to produce it myself! This is a post in reference to several questions: 1. to make it harder increase your percentage of wax; 2. 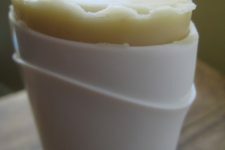 Candelilia wax can be substituted for beeswax at 1/2 the amount, it is much harder than beeswax; 3.you could skip the coconut oil and increase the amount of either cocoa butter or shea butter so that you still have the same amount of oils/butters. Another thought I just had is avocado butter it is softer than coconut oil, but so good for your skin. 4. For wetness, increase arrowroot powder and/or baking soda. anyway these are just my thoughts on these matters hope this helps and is a success for you. I wouldn’t decrease the coconut oil, as it is one of the active ingredients. Many people use just coconut oil by itself as a deodorant. Where can you find those roll up container for the deodorant? Thank you! You can clean and re-use containers from deodorants that you have already purchased and used up. You can also buy new deodorant dispensers on Amazon. I buy all my containers from either Container & Packaging Supply or Bulk Apothecary. The ones shown in the picture can be ordered from elementsbathandbody.com. I make and sell a number of natural products and anytime I make a foot balm, sunscreen, deodorant etc. that can be put in a container like this I use the one from elements. Happy shopping and creating!!! You can always clean and re-use containers from deodorants that you have already purchased and used up. I would like to try this for myself because at the monent all I use is lime juice, which works really well but doesn’t smell as nice as I imagine this might. Thanks for sharing! You’re website is everything I’ve been looking for. It is so nice to know there are others out there who want to be more self-sustained. Thank you for sharing all your info. It’s so nice to have everything in one place. Keep it up! What a fantastic idea, I can’t wait to try and make this as I’d love to be able use a decent aluminum-free deodorant for me and all the family. What fragrances would you use to make it a woman’s deodorant? Is there something that is as effective for odors as baking soda that you can use in place of it? I used to make our deodorant until I started breaking out in terrible rashes. Turns out my skin hates baking soda! It doesn’t matter how little I would use I would still break out but if I left the soda completely out the deodorant hardly did anything at all for odors. It was such a let down! We don’t like the crystals. 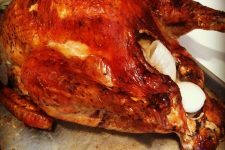 Hi, and thanks for the recipe(s) – I’ve made my own before from a different recipe, but saw this and thought I’d try this one. I see you have your own that you sell as well – very cool. Where do you get the dispensers? I hate using used ones from around the house and would like to get 4 or 5 of those new ones. As far as odors are concerned: I too am allergic to baking soda under my arms. Just use the whole amount in Arrowroot powder. It works great! I’ve tried many recipes and this is by far the best one. The probiotics make a huge difference. Also, for a woman, I love peppermint, spearmint or any citrus. Smells great! Hey, I was wondering if there was any way you could think of to incorporate water kefir into this recipe for the probiotics. If you increased the powder or decreased the oils, perhaps? Or would it seperate? I can buy some probiotic capsules if I need to, I was just thinking it would be nice to use something with more strains that I already have access to. Thanks so much!! I tried out my first batch today, and I was amazed! My husband sweats…a lot. We haven’t found a good commercial brand that holds well all day for him. I made this up and had him try it out, and he refuses to finish off his old bar of deodorant! Thank you! Just wanted to point out that bentonite clay, although natural, is aluminum based. So it’s not, strictly speaking, an aluminum-free recipe. The aluminum in bentonite clay is entirely different than the dangerous aluminums in deodorants. 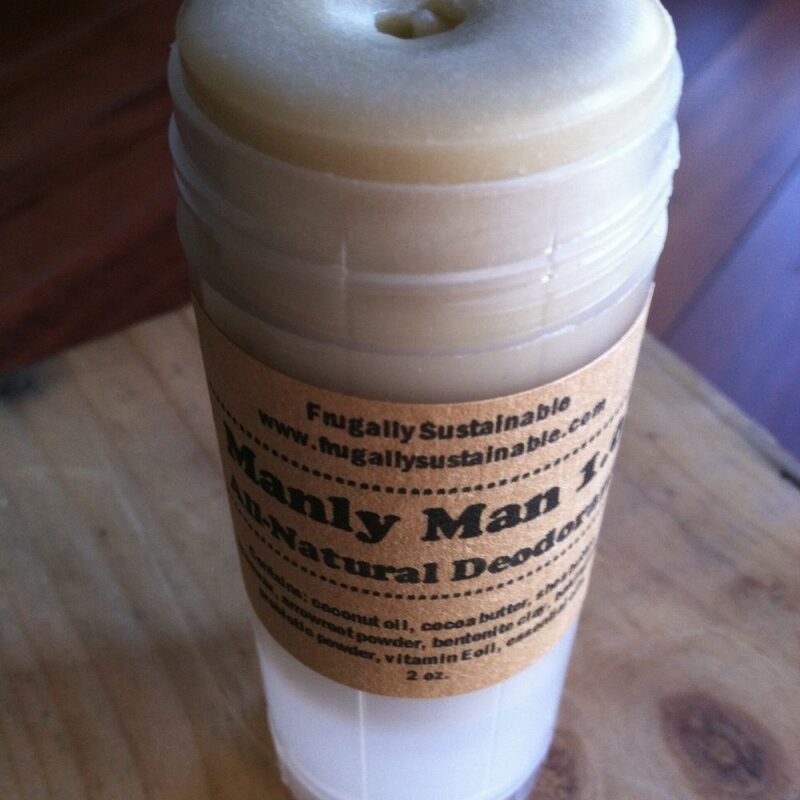 I was wondering if I could buy the natural man deodorant you make? If so, how much? Let me know. Good post. Aluminum is incredibly dangerous and is believed to inflict significant damage on the brain and other internal organs. I cannot believe people still use anti-perspirants. An excellent alternative is Lavilin, an all-natural deodorant that is SAFE. I would recommend using the deodorant tubes (like Old Spice) that have the creamy deodorants. They have the cap which allows the creamy suff to be squeezed through the top….just a remedy for the jar-and-dab routine in a tube format. 🙂 It’s what I use, plus it’s compatible to be used for a stick (for the winter, when the coconut oil is more solid) or with the “collander-type” cap it can be used for the summer, or for creamy deodorants. Hope this helps! I’m so glad I had a quick read through of comments before making this for my hubby because your insight is very helpful. Since the author hasn’t responded I will throw in my two cents. I would reduce the beeswax by half and see how that works. The more beeswax you have, the harder the finished product. Using less will leave it creamier, and therefore will have more glide. hi, how long it can be kept? Great article. I have a question: I’ve been using more clay recently (earthpaste, clay mixed with water and drinking it, an occasional capsule or two filled with Redmond clay, and I also mixed it in with my homemade deodorant). I noticed since I added clay to the deodorant I’ve gotten an itchy rash under my arms. Also, sometimes when I drink the clay with water, especially first thing in the morning, I get a bad headache. Do you think the rash and the headache could be a detox reaction from the clay? Is there any documentation that this could happen? Leah , I was looking up some info on the food grade (sodium-based) bentonite clay and the general side effects that have been known to people who have used it internally include intestinal discomfort. You can minimize or avoid this side effect by drinking plenty of water and other fluids until the bentonite in your system passes. During an initial detox, you may experience secondary side effects which include headaches, muscle pain and joint stiffness as stored toxins are released from your system. When you repeat this process, you may experience these side effects again, although less severely than during your first cleanse. I was wondering if I could substitute arrowroot powder for tapioca powder. Hey! I was wondering, to make this a more woman-ly smelling deodorant should I just use different essential oils that smell nice like lavender or cinnamon? thanks. I’m a bit late, but if you like cinnamon, a good “feminine” smell with cinnamon I’ve diffused is cinnamon, orange, and a tiny bit of ylang-ylang. Maybe 8 drops orange, 4 drops cinnamon, and 1-2 drops ylang-ylang. If you like lavender, you could try 10 drops of lavender + 5 drops of a citrus oil. You could also just use lavender by itself in the deodorant if you want to keep it simple. I’m eager to try this recipe. For years, I’ve combined coconut oil with arrow root, tea tree oil, and baking soda to make my own deodorant. It’s nice to see a new variation. This sounds like a great recipe. Have not found a recipe so far that my men will actually use. Do you by chance have these ingredients in weight, rather than volume, measurements? I was wondering, you say this is aluminum free but when i google bentonite clay i find that the clay is aluminum? Bentonite clay can be aluminum, sodium, or calcium. It depends on the source from which you get it from. Some is aluminum free and some are a mix. Know the source you are getting it from. Does the clay stain clothes? why the probiotic? What does it do? Could you use Kokum butter in this? Would you replace the Cocoa Butter or the Shea butter, or both? Since the bentonite clay has a gray tint, does it stain your clothes gray when you perspire? I’ve noticed the homemade deodorant I make with Shea butter stains my clothes yellow. Made this tonight – easier than I thought it would be to make. I used all cocoa butter (no Shea), kaolin clay, soy wax, and no probiotic (had none)! Can’t wait to try and see the results!! Thanks for the recipe! For the essential oil blends (i.e. Vetiver, Black Pepper, Bergamot, etc.) you list above, what are the amounts/ratios? Thanks. Amazing, I was looking for something like this. 🙂 Can’t wait to try this out tonight. How you claim aluminum free but then add bentonite which is an aluminum phyllosillicate which meansits a mineral that contains the elements of aluminum, silicone, and oxygen? Hi! I love this recipe, but I have a question. The bentonite clay made my deodorant VERY grey. Is there white bentonite I can get, or a white clay that can be used in its place (like kaolin)? My son is testing this, and I’m hoping it doesn’t stain his clothes! Way too complicated with far too many ingredients for me to bother with. I want something simple that doesn’t require searching out, buying, and preparing a list of ingredients so long it could stretch from ones underarm to ones fingertips!